Ando Museum, Naoshima, Kagawa, Japan. Photographed by Yoshihiro Asada. 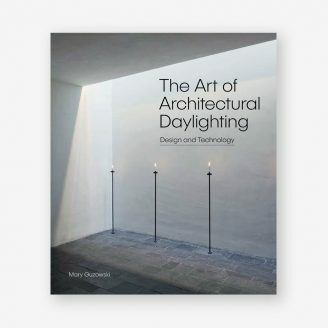 Mary Guzowski’s fascinating new book – The Art of Architectural Daylighting – reveals how architects have bridged the poetic and practical potential of daylighting to create exquisitely illuminated spaces. Atmospheric light celebrates the qualities and moods of light to a particular location. 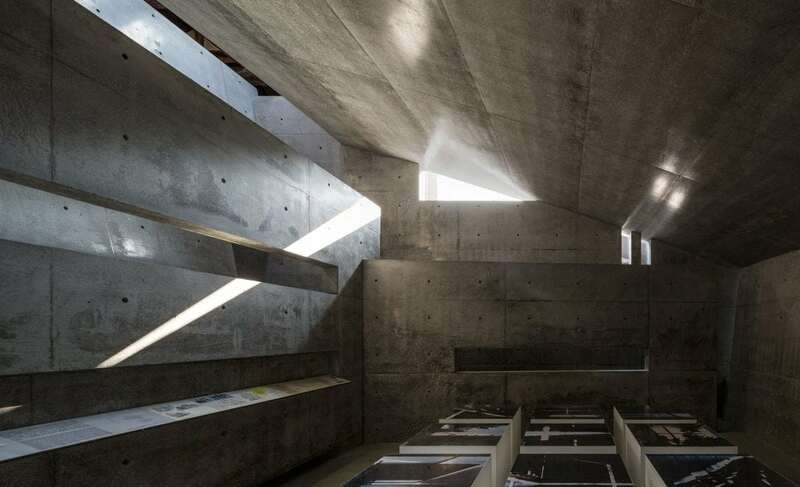 This brief case study of ‘Ando Museum’ from The Art of Architectural Daylighting, explains how architect Tadao manipulates light for the desired atmospheric effect. Ando Museum is located in the historic town of Honmura, Naoshima. During the past thirty years, the island of Naoshima in the Seto Inland Sea of Japan has become an art and architecture destination for visitors from around the world. Over the decades, this quiet island, together with neighbouring islands, Teshima and Inujima, has been transformed by new museums, architecture, and art installations by renowned international artists and Japanese architects to celebrate the beauty of art and nature. Tadao Ando has been involved from the onset, and has designed numerous projects, including the Naoshima International Camp, Benesse House, Art House Project “Minamidera”, Chichu Art Museum, Lee Ufan Museum, and the recent Ando Museum. Ando Museum, Naoshima, Kagawa, Japan. Photographed by Yoshihiro Asada. 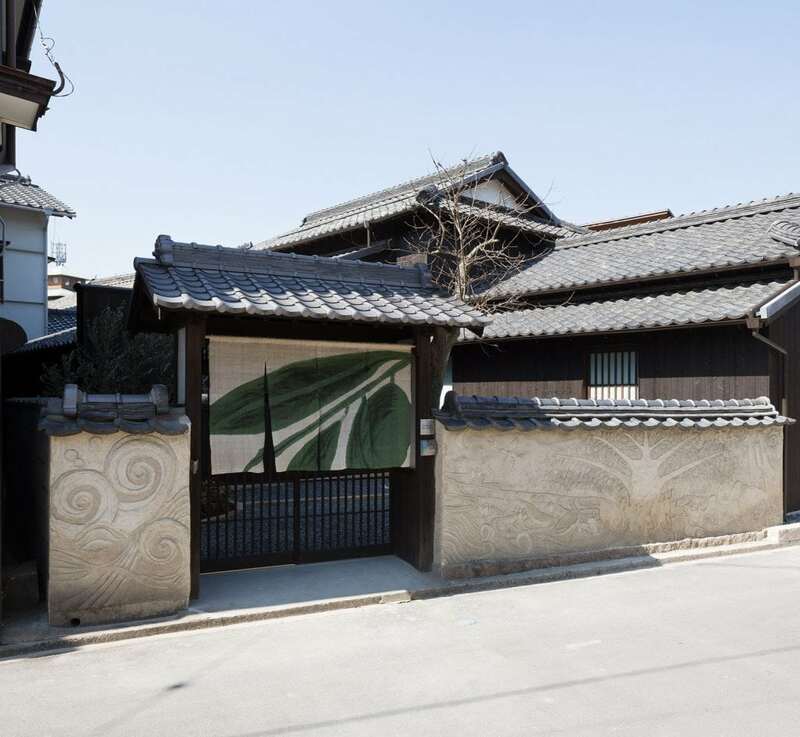 – Street View of the entry gate and reconstructed traditional Japanese house and new museum. The minimal garden, conical skylight and horizontal window quietly suggest the contrast between traditional and contemporary structure, materials and daylight found within the museum. Naoshima is nested within the protective shelter of the main islands of Japan, with panoramic views of the surrounding water, mountains, and islands. The humid subtropical climate is predominantly clear, with the exception of the rainy season in summer, which typically lasts from June to mid-July. Located at 33.6° north latitude, the island experiences relatively long hours of daylight throughout the year, ranging from approximately 10 to 14 hours on the winter and summer equinoxes respectively, when the noon-sun altitude varies from a seasonal low of 32.9° to a high of 79.9°. The quality of daylight is soft and indirect during the rainy season, when diffuse daylight enters the building from multiple orientations, while clear skies bring the sunlight’s high contrast, rich colours, and warm solar rays. Visitors move from the historic streetscape through an entry and into the traditional house to discover a sequence of daylit galleries that culminate in a quiet underground meditation chamber. The small scale and intimate qualities of the site heighten the juxtaposition of the old and new, with spaces progressively transforming from traditional to contemporary in the experience of space, structure, and light. With the exception of the entry area, the Ando Museum relies exclusively on natural light for illumination, with the galleries and meditation chamber brought to life through the changing moods, colours, and movements of daylight. Ando explains that he sees light as an expression of nature that helps us understand our place within a greater whole. 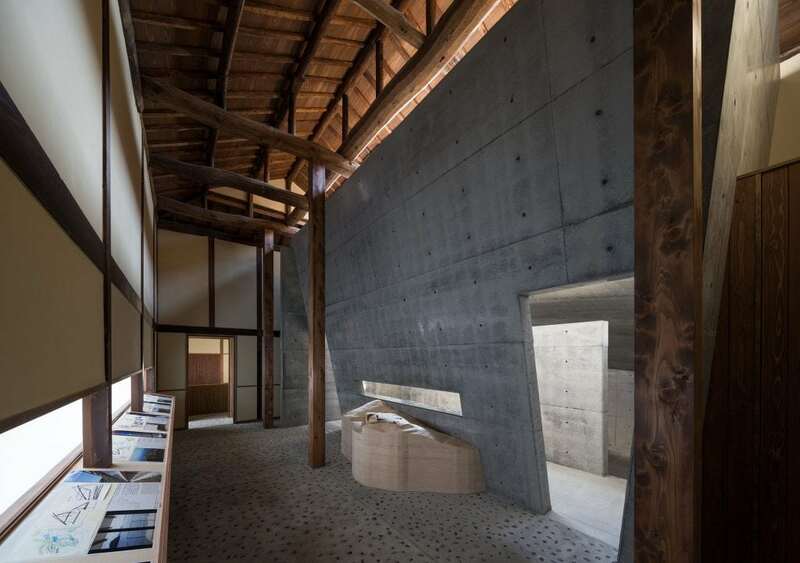 Tadao Ando describes the underlying theme of “invisibility” in the Ando Musueum, where the traditional house is a vessel that contains his contemporary interventions of space, structure, materials, and light. The elements of surprise and discovery are essential to the visitor’s experience of the Ando Museum. It is not until the visitor is deep inside the museum that the new interventions are fully revealed with a dramatic contrast of space and light defined by concrete surfaces and volumes tucked within the traditional timber-frame house. A geometric clarity and spatial order underlie the organisation of the museum. While Ando is renowned for his exquisite craftsmanship, quality of construction, and refined detailing; he describes his work as a focus on space that is “born of light and geometry”. Ando Museum, Naoshima, Kagawa, Japan. Photographed by Yoshihiro Asada. – A Skylight in the south-facing roof admits daylight to the central gallery, while thin vertical and triangular windows provide direct sunlight in the south gallery. A conical skylight, hidden above a hovering ceiling plane, indirectly illuminates the walls of the underground meditation space. The site is divided into four quadrants, with the entry and garden in the southeast, museum entrance in the northeast, main galleries occupying the west half of the site, and the underground meditation chamber beneath the garden. In section, the museum reveals a sequence of nested spaces, with the concrete surfaces and volumes of the new galleries tucked within the traditional timber-frame house. Visitors move through a choreography of spaces that transform from outside to inside, old to new, above to below, and from light to darkness. In the journey from the street into the galleries and underground meditation chamber, visitors transition from connections with the outside neighbourhood to progressively more inwardly focused contemplative spaces. The first view into the museum frames a dramatic vertical space created by the traditional plaster wall to the north and a canted concrete wall to the south. A sequence of three gallery spaces is defined, from the north to south, by sloping and freestanding concrete walls and volumes tucked beneath the traditional timber-frame construction. Daylight is reflected between room and ceiling surfaces to spill over the freestanding concrete walls and through low horizontal slots to adjacent galleries. Each gallery has a unique luminous quality, with a calm diffuse light in the northern gallery punctuated by abundant illumination in the toplit central gallery, which is contrasted by the quiet shadows and darkness of the southern gallery. Ando Museum, Naoshima, Kagawa, Japan. Photographed by Yoshihiro Asada. – The Conical skylight above the underground meditation space is hidden from view by a floating ceiling plane. A narrow gap between the ceiling plane and the walls enhances the luminous contrast and sense of mystery. A hidden structural frame anchors the “hovering” concrete ceiling to a roof structure above the ceiling. 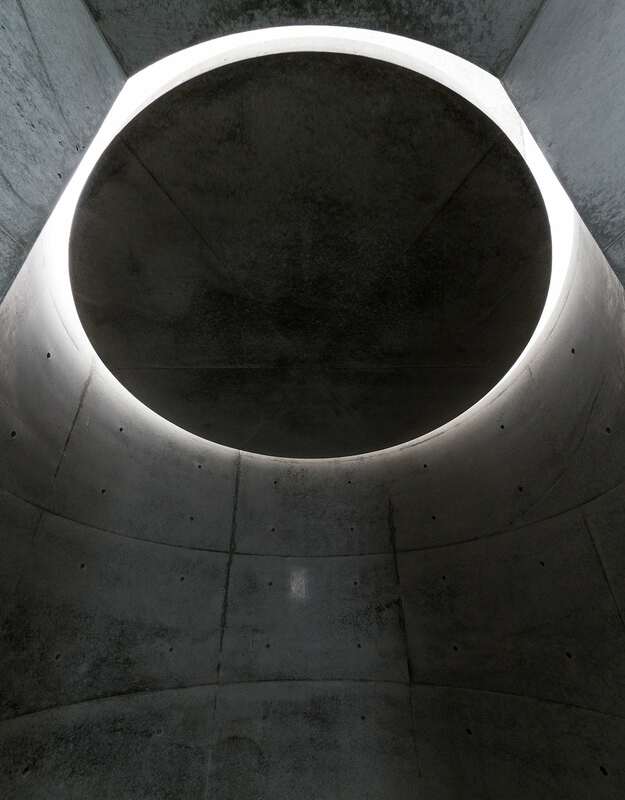 The meditation chamber is constructed of a concrete cylinder with canted walls that are illuminated indirectly through the conical skylight. Beneath the skylight floats a steel ceiling with a thin gap along the perimeter to block direct views of the sky and to reveal the walls and volume of space in reflected light and gradated shadow. Views to the outside and within the museum are carefully controlled, with an increased sense of separation from the site as spaces progress from the garden into the entry, galleries, and subterranean meditation space. The only direct view to the garden is provided at the entry door, while discreet views of the sky are found in the central and south galleries. Translucent windows and indirect and reflected daylight foster a sense of mystery within a quiet, contemplative atmosphere. The sequence of spaces is organised along a circulation path with ninety-degree turns that create views to alternating cardinal directions, while the partial walls and interior apertures provide glimpses to and beyond adjacent spaces. Strategic interior views create spatial depth and interconnections between galleries that are animated by differing qualities of light and shadow. 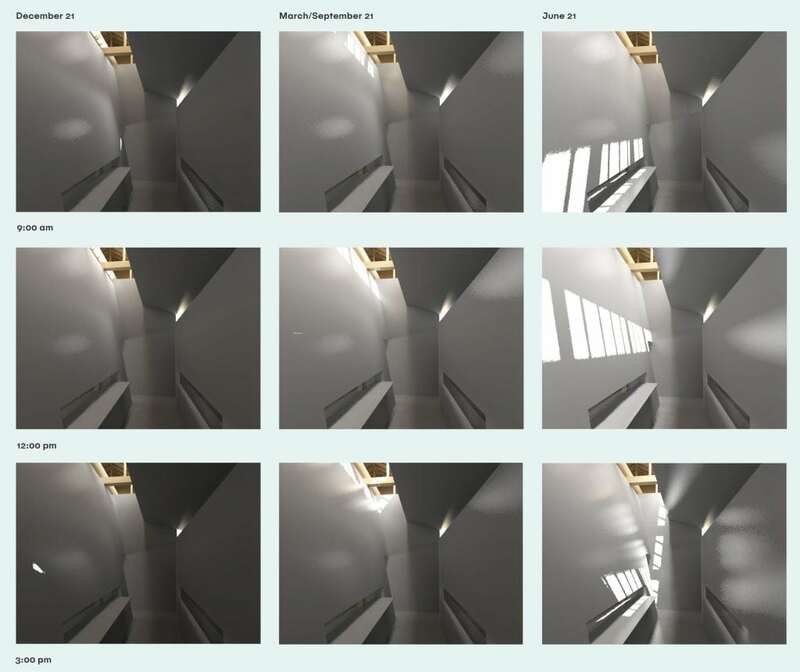 Time lapse renderings of the central gallery illustrates the dramatic seasonal and diurnal changes in the quality and distribution of daylight throughout the year. Such is the case at the Ando Museum, where varied window forms, daylight strategies, and choreographed views create an experience of changing atmospheric qualities and patterns of light that can be considered an exhibition in its own right. 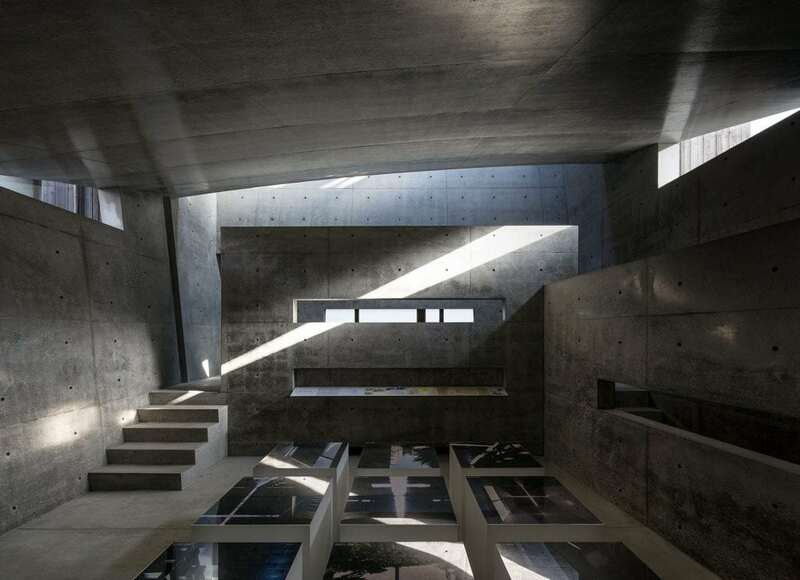 The beauty of both light and shadow are found in the changing atmospheric qualities of the Ando Museum. Depending on the season and sky conditions, the light varies dramatically from a soft, subdued, indirect, and diffuse illumination of overcast skies to dynamic patterns of sunlight animating space and surfaces on a sunny day. Gentle indirect light emanating through frosted glass windows and surface reflections is contrasted with direct daylight or sunlight from skylights, vertical slots, and triangular windows. Contrasting qualities of indirect and direct light engage and enliven the warmth of the traditional timber ceiling and post-and-beam structure as well as revealing the beauty and craft of the smooth surfaces of the contemporary concrete walls and volumes. Ando Museum, Naoshima, Kagawa, Japan. Photographed by Yoshihiro Asada. – Triangular clerestory windows and vertical slots on the east wall admit direct sunlight to the south gallery. Horizontal slots in partition walls provide glimpses to the stairwell and adjacent toplit central gallery. Ando Museum, Naoshima, Kagawa, Japan. Photographed by Yoshihiro Asada. – Direct and reflected light wash the walls of the central gallery. Horizontal slots provide views and borrowed light to the adjacent north and south galleries. The warm timber structure of the traditional roof contrasts with the smooth surfaces of the contemporary concrete galleries. 20 Spatial, material, and luminous contrast are further fostered by the separation between the timber-frame and plaster walls of the minka and the freestanding concrete structure. 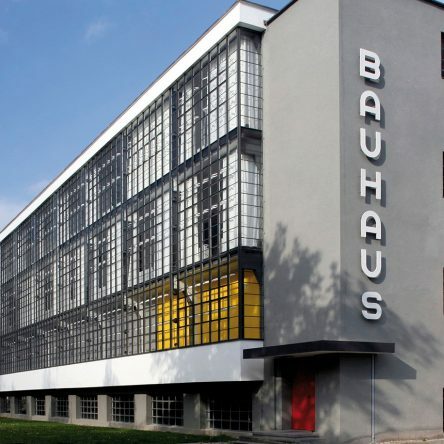 The exceptional craft and material qualities of each construction tradition are independently expressed, yet remain within an intimate spatial relationship. While the Ando Museum embodies a clarity and simplicity of form, structure, and materials, these tangible architectural elements are used to create a dynamic spatial and visual experience and to express the beauty of light and nature. Ando Museum, Naoshima, Kagawa, Japan. Photographed by Yoshihiro Asada. – A Sliver of direct sunlight washes the north partition wall of the south gallery. Horizontal slots, partial walls and nested rooms create spatial depth and layered ambient illumination. 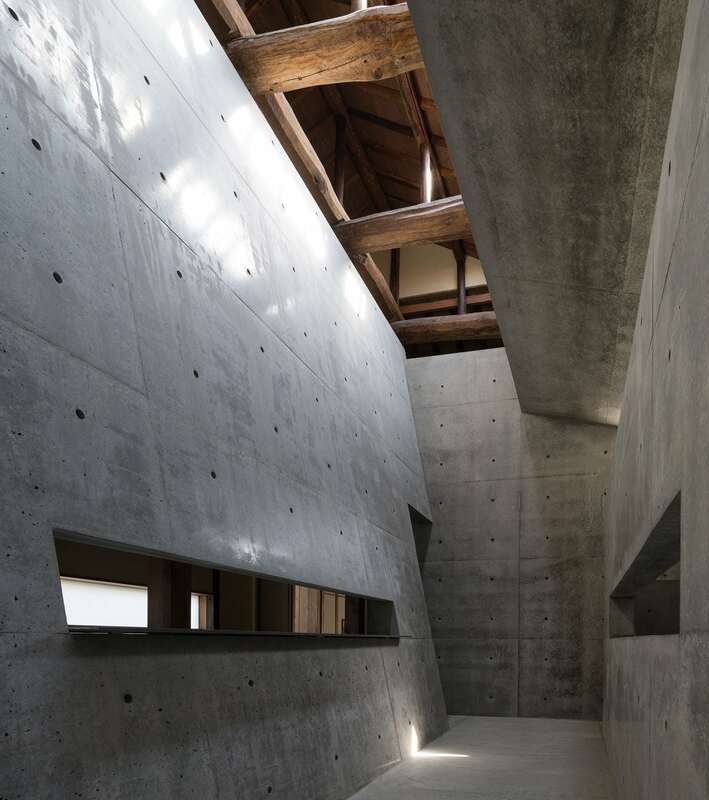 The Ando Museum is brought to life by light and the juxtaposition of atmospheric and spatial qualities. 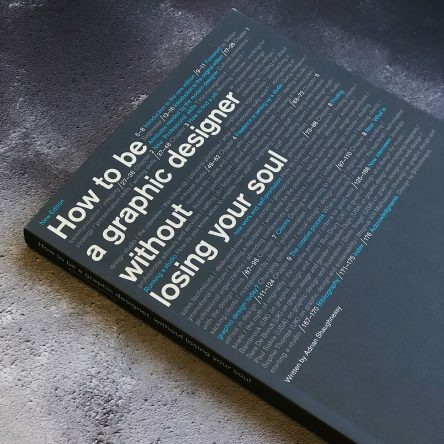 Ando uses the elements of structure, materials, and spatial composition to choreograph a luminous journey of discovery from the outer physical world to an inner contemplative space.